Do you want an exciting new dish on your dinner table? Well, try this Beef in Beer and Mushroom Gravy. 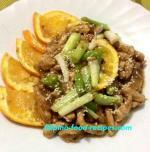 This was inspired by the Lengua (Ox tongue) dish my sister, Beng, used to cook when we were living in Malabon. But since my wife and kids would never eat the ox tongue, I used beef, instead. So, it starts with a big piece of sirloin or beef chuck, boiled in beer, onion, garlic, water and pepper. Then, the mushroom gravy is prepared separately by first making a roux (butter and flour), then adding the mushrooms, soy sauce and some pepper, then some of the liquid from the boiled beef is added plus the dried basil to give that beef gravy taste. Don't worry about the cooking with beer, the alcohol should have dissipated from all the simmering that kids could eat this dish, too. 1. Cook the beef in beer and water, onion, garlic and black pepper in the pressure cooker for 30 minutes or until tender. 2. Cut the beef thinly and set aside. 3. In a separate pan, melt the butter and add the flour. Add the mushroom and cook for a minute on medium low heat. 4. Add 2 cups of liquid from the cooked beef and stir thoroughly. 5. Add the soy sauce and dried basil and bring to a boil. Adjust the seasoning to your taste. 6. 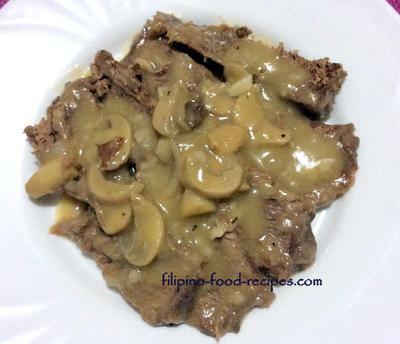 Arrange the beef on a platter and top with the mushroom gravy.